Data Observation Network for Earth's (DataONE's) foundation for excellence is the expertise and established partnerships among participating organizations that have multi-decade expertise in a wide range of fields including: existing archive initiatives, libraries, environmental observing systems and research networks, data and information management, science synthesis centers, and professional societies. The chart above depicts the structure of organizational relationships between various groups within DataONE. These relationships are not exclusive and there are multiple opportunities for collaboration and integration, a major strength of DataONE. You can click on individual boxes for more information. 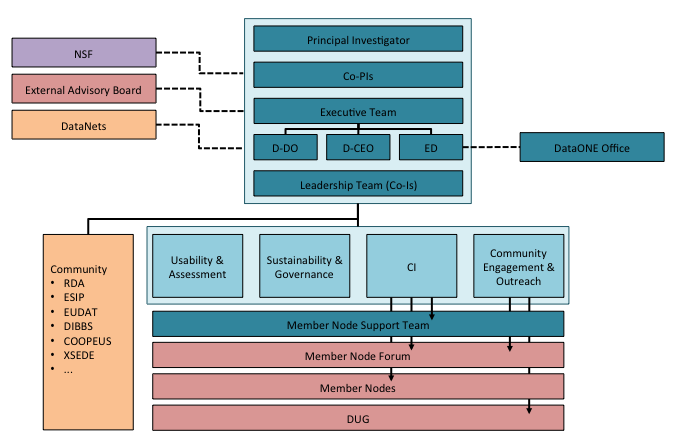 The PI reports to the External Advisory Board, interacts with NSF, coordinates with other DataNet partners, supervises the Executive Director, participates in development of the long-term governance and sustainability plan, and facilitates activities of the DataONE Leadership Team. The PI has strategic leadership and communications roles, including leading strategic planning efforts, partnership coordination, and fund raising activities. The Executive Director (ED) is responsible for the day-to-day operations of DataONE—overseeing and coordinating all technical, management, reporting, and budget issues. The ED contributes to strategic planning efforts, directs and tracks the implementation plan, supervises the Directors for Development and Operations and Community Engagement and Outreach and the DataONE Office staff, and communicates and coordinates across all facets of the DataONE enterprise. The ED may participate in one or more Working Groups and DataONE partnering activities. The Director for Development and Operations (D-D&O) oversees development and implementation of architecture, computer science research, and technological evolution through the activities of the Working Groups and the Core Cyberinfrastructure Team (CCIT). The D-D&O oversees developers and post-docs at UNM and the activities activities of developers and post-docs at DataONE sub award institutions. The Director for Community Engagement and Outreach (D-CE&O) engages the community through the DataONE Users Group, Working Group participation, and contributes directly to DataONE education and outreach activities. The D-CE&O supervises CE&O staff at UNM and CE&O activities at DataONE sub award institutions. The CE&O also overseas the Education and Outreach program, organizing and leading training sessions related to data management, best practices, and DataONE tools and services. The Leadership Team (LT) encompasses the Co-PIs and representatives from key institutions and focal areas. The LT confers weekly with DataONE key personnel to provide advice and guidance with respect to strategic organizational directions (including routine risk assessment), project implementation, collaborative opportunities and community engagement, personnel, and other matters that are central to project success. The PI, ED, and directors (D-D&O and D-CE&O) are non-voting ex officio members of the Leadership Team. The DataONE External Advisory Board (EAB) provides strategic direction, input, and guidance to all DataONE activities. The EAB helps facilitate community involvement, review, and sustainability activities related to the DataONE network. Working Groups are central to DataONE in conducting research, specifying cyberinfrastructure, and engaging the community. The Working Group model allows us to conduct targeted research and education activities with much broader groups of scientists and users than are directly involved in the DataONE proposal. Working Groups are also designed to enable research and education activities to evolve over time. As the topics for one Working Group are resolved, or as the needs of DataONE are better specified or change, the number and foci of the Working Groups will evolve. Each Working Group has at least two co-leaders who are compensated to organize the activity and propose solutions to particular research, education, and cyberinfrastructure problems.